I have one account with privilege to manage S3 (S3_User), and another one to manage Cloud Front (Cloud_Front_User). Now, I've created a bucket "bucketname" with S3_User and a distribution with Cloud_Front_User with origin my S3 Bucket. but when I click on "Save", after some time I get an error message saying that it wasn't able to set identity on the S3 bucket. I think this is because I manage CLoudFront with "Cloud_Front_User" and S3 with "S3_User". So, how could I manually set S3 policy on the bucket to allow CloudFront to access s3? 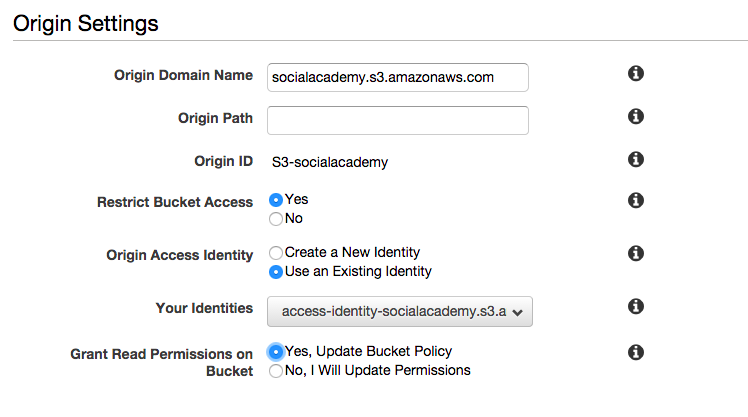 "AWS": "arn:aws:iam::cloudfront:user/CloudFront Origin Access Identity E780000000000"
How to Allow Public Access to an Amazon S3 Bucket If you're trying to allow anyone to download or open files in an Amazon S3 Bucket, here's how to do it. Copy and paste this code in the Bucket Policy Editor popup. You’ll need to replace “YOUR-BUCKET-NAME” with your full bucket name. Why is only index.html available from an S3 bucket served by CloudFront, and nothing else? How do I limit S3 object access to CloudFront only?